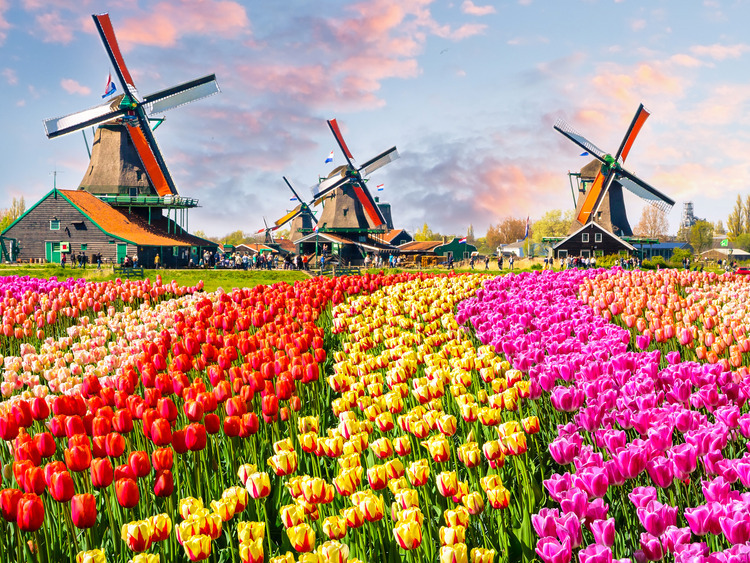 Holland is known throughout the world as the country of tulips, canals and...windmills! So this excursion which takes us to visit the authentic, rural Holland is a must, with its vast green plains and magnificent windmills that are reflected in the water. The first destination on our itinerary is one of the most charming places in the Netherlands: Zaanse Schans; the name means "Fortification on the river Zaan" and refers to its original purpose during the 80 years' war, the revolt against Spanish rule, between the 16th and 17th centuries. We enter a typical 18th-19th century village: vibrant and industrious, full of wooden windmills, barns, homes and museums, approximately 35 wooden buildings built in the typical Dutch architectural style and transported, piece by piece since 1961, to this magical open-air museum. It is a unique experience, stepping into the past with all the images, scents and flavours of times gone by. We walk through the wonderful magical landscape, we visit some of the many windmills and historic buildings, and browse the artisan shops where the traditional clogs are made and the famous Dutch cheese is produced. The next part of our itinerary takes us to the charming Catholic village of Volendam, a famous tourist attraction renowned for the traditional clothes that some of its residents still wear and for its old fishing boats. Before exploring this romantic fishing village, we have lunch in one of the inviting restaurants. After lunch, we can take advantage of the free time at our disposal in this picturesque place to walk along the quay lined with typical green wooden houses with red sloping roofs and admire the delightful marina and the docked boats being rocked by the delicate motion of the sea. Or we can stroll through the picturesque narrow streets, lined with typical little houses standing side by side, and cross the charming canals overlooked by small wooden bridges. This tour is only suitable for guests with flights leaving after 17.30hrs. The Windmill Village can be visited as normal. The ancient windmill at Zaanse Schans can only be entered by taking five steps (only to get to the entrance). Inside the windmill guests need to take steep, small stairs to go to the first floor.